Many people like to have many open tabs in Safari windows. Some people are born to be tabulous, while others (like me) are mostly anti-tab. I’m referring to the tabbed windows in Safari, which can multiply like rabbits in spring as you Command-click or Command-Shift-click to open links from the window you’re viewing in another. I hear tales of people with hundreds of tabs they leave open, and it gives me the heebie-jeebies—I keep tabs open only as long as I need them. While your working method is your own and, of course, valid no matter what your choices, there’s a downside to having a lot of tabs: you might accidentally close multiple tabs you need, close a window full of tabs, or suffer a Safari or macOS crash that doesn’t restore your windows. I’ve found Safari remarkably resilient in recent years to crashes of all sorts, and rarely have this problem. But because I don’t have windows full of tabs, even if I lost one, it wouldn’t have the same impact. After closing a tab or window, you can use History > Reopen Last Closed Tab/Window (Command-Shift-T for either). You can also browse through History > Recently Closed to find tabs (as single items) and windows (as a main item with sub-item menu or other tabs in that window). 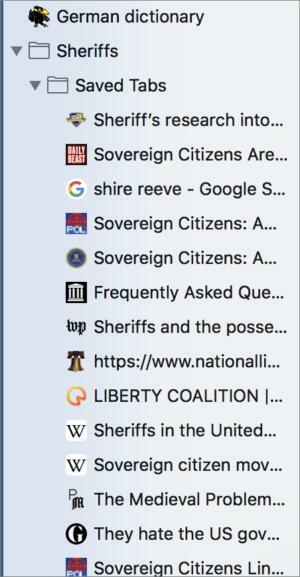 Research on sheriffs I had loaded into a window of tabs I saved as a folder of bookmarks. But you can also opt to snapshot or store entire windows full of tabs as bookmarks, something that used to require third-party extensions. Select a window with tabs. Choose Bookmarks > Add Bookmarks for These X Tabs, where X is the number of tabs. Pick a folder and enter a name for the bookmarks folder created from the window. This is a great bit of extra security against a crash. There’s no way to sync your tabs to that bookmarks folder, so as you modify what’s in your open windows, you have to delete the previous folder full of saved tabs (via Bookmarks > Edit Bookmarks most easily), and then save a new folder of them. Or, because bookmarks take up almost no space, you could progressively save new folders numbered or named in some scheme that helps you know which is the latest one. Bookmark folders are also a useful way to transfer tabs between devices if you’re using iCloud to sync Safari settings. While you can use Handoff to pass a single active window, or Show All Tabs to view open tabs on other devices also syncing via iCloud, synced bookmarks offers a much simpler way to gain access to all those tabs on any device you might have to hand.